It has long been known that drinking coffee close to bedtime can increase the time that it takes to fall asleep and change the structure of our sleep. It was thought that these effects were primarily mediated through caffeine’s alerting properties; it binds adenosine receptors which causes the release of excitatory neurotransmitters. Research published this month in Science Translational Medicine by Tina Burke and colleagues has shown that caffeine consumed close to bedtime can also affect the functioning of our circadian body clock. The circadian body clock is a small group of cells found in the hypothalamus in the brain, which regulates our ’24-hour’ processes, or circadian rhythms. These include fluctuations in core body temperature, release of some hormones, and sleep/wake timing. In order to know what time of day it is, the clock receives cues from the outside world. The strongest of these cues is light, but other cues such as meal times, physical activity and social interaction can also have an influence on the timing of the clock. We are not able to (ethically) measure the activity of the human circadian clock directly, so we choose to measure some of the rhythms that the clock regulates. An accurate indicator of the timing of the circadian clock is the hormone melatonin. The clock produces daily fluctuations in melatonin that can be measured fairly easily in saliva and urine. In humans, melatonin is also the main hormone that tells our bodies that it is night time and sets about a cascade of events that promotes sleep and other nocturnal activities. 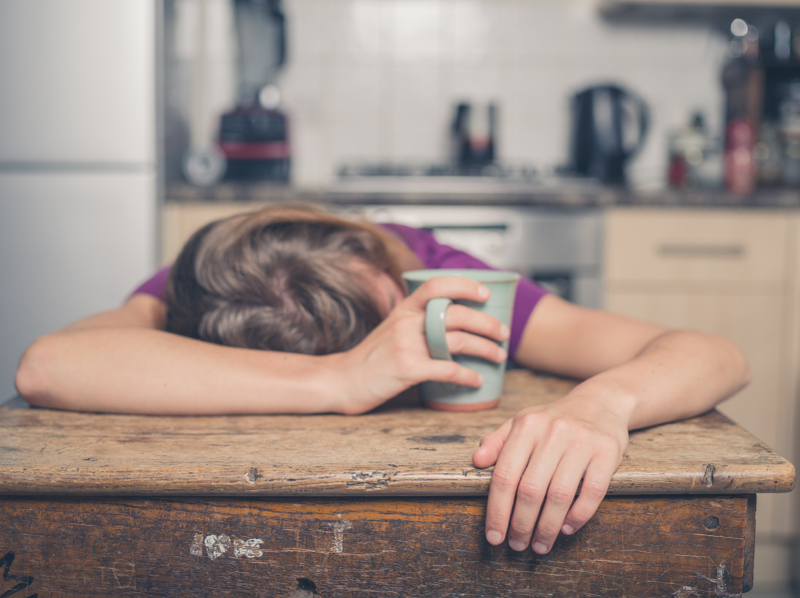 Prompted by previous research in animal and insect models that had shown that caffeine influences the body clock, the researchers in the current study investigated whether the same effects could be seen in humans. In laboratory conditions, they gave participants 200mg caffeine pills (equivalent to two standard cups of coffee) 3 hours before their usual bedtimes. They then measured melatonin levels at frequent intervals to examine whether there was any change in the timing of melatonin production. They found that caffeine delayed the timing of melatonin production by approximately 40 minutes, indicating that the function of the circadian body clock had shifted later. The researchers wanted to compare the effects of caffeine with bright light, which is known to have a strong influence on the circadian clock. They gave 3 hours of bright light starting at the participants’ usual bedtime and observed an approximate 85 minute delay in clock timing. Combining caffeine and bright light did not produce a significant increase in the size of the delay. Burke and colleagues suggested that this may be because the bright light exposure had resulted in the maximal shift in clock timing possible for that time of day. In order to better understand the mechanisms by which caffeine could affect the clock, the researchers used human bone osteosarcoma epithelial cells to investigate cellular actions of caffeine with respect to circadian rhythms. They found that caffeine influences the timing of the circadian clock by acting through adenosine A1 receptors, although additional mechanisms may also be possible. These findings raise some interesting questions. We know that giving a time cue (such as bright light) at different times of the day produces different effects on the clock. Light given in the subjective morning for example advances the clock (shifts it earlier) and light given in the subjective evening delays the clock. It is not yet known if caffeine can have similar effects. That is, does giving caffeine at different times of the day produce different effects on the clock? If so, this might have implications for excessive caffeine consumers, coping with jet lag, and treatment of circadian sleep disorders. It will also be interesting to investigate what the flow-on effects of caffeine are for subsequent days’ sleep. If having a cup of coffee before bed delays the clock, then this might influence the timing of sleep the following night (even without additional caffeine), if the clock is unable to re-synchronise to the day/night cycle.